Lighting adds a dramatic, beautiful finishing touch to any landscape or waterscape project. Place lights in and around landscape accents or water features to highlight key design elements. Illuminate focal points, areas where your Koi fish congregate, or assure greater safety at night. Cool running LEDs emit a warm natural light. 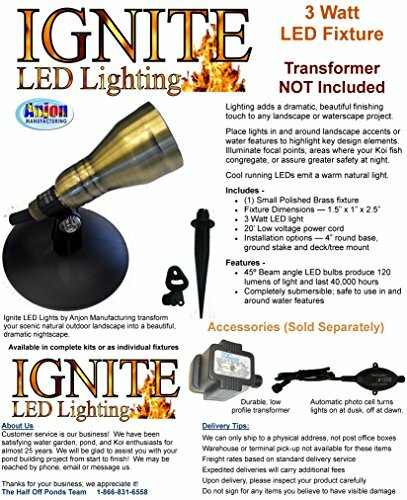 Completely submersible; safe to use in and around water features; Ignite LED Lights by Anjon Manufacturing transform your scenic natural outdoor landscape into a beautiful, dramatic nightscape. If you have any questions about this product by Ignite, contact us by completing and submitting the form below. If you are looking for a specif part number, please include it with your message.